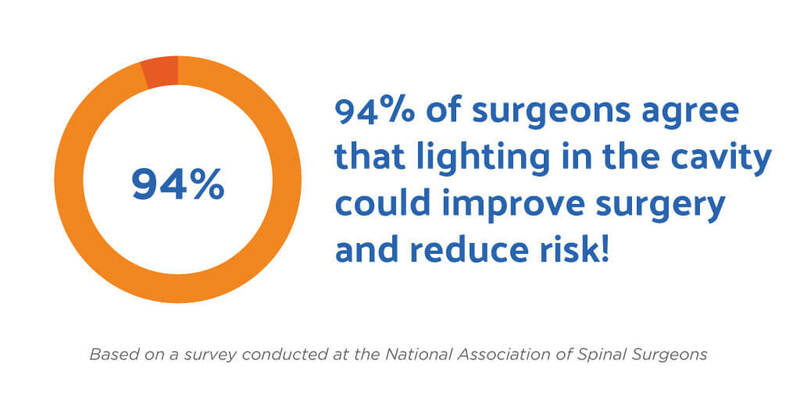 Would you say quality lighting is essential for operating rooms? "You cannot see what you are doing if you don’t have good light. You are doing delicate procedures and lighting is the most important part of surgery" – Surgeon at Duke University Medical Center. 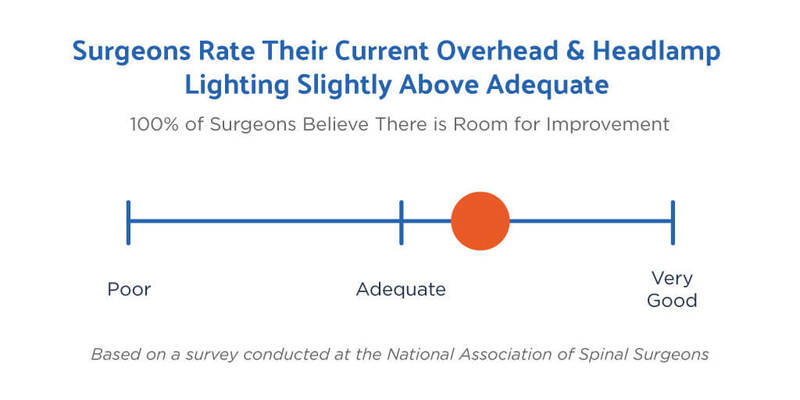 According to our findings from the surgeon surveys conducted at NASS 2017, surgeons are rating their current overhead and headlamp lighting as adequate. 100% of the surgeons said that good lighting is critical to the safety and efficiency of the procedure, specifically in lateral, minimally invasive and deep cavity cases. So if lighting is critical and traditional lighting equipment is only adequate, this poses the question of how lighting can be improved. Operating rooms require specific pieces of equipment. Many of which are high-tech used for advanced surgeries and would be inadequate without integrated lighting. As a custom medical device lighting company, our passion is bringing lighting solutions that enhance these products and impact lives. High quality surgical lighting is critical to perform sophisticated procedures in the OR. 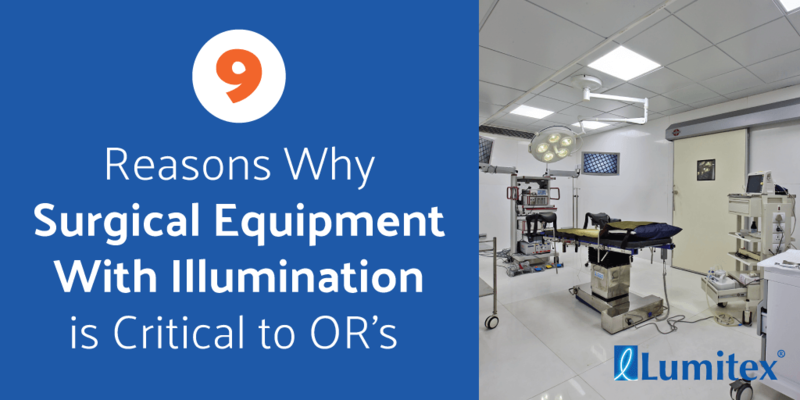 Bonus Content: 9 Reasons Why Surgical Equipment With Illumination is Critical to OR's as a PDF. Easily save it to your computer or print for reference. 1. User Control Lighting - Flexible lighting ensures a surgical suite can meet all its needs. 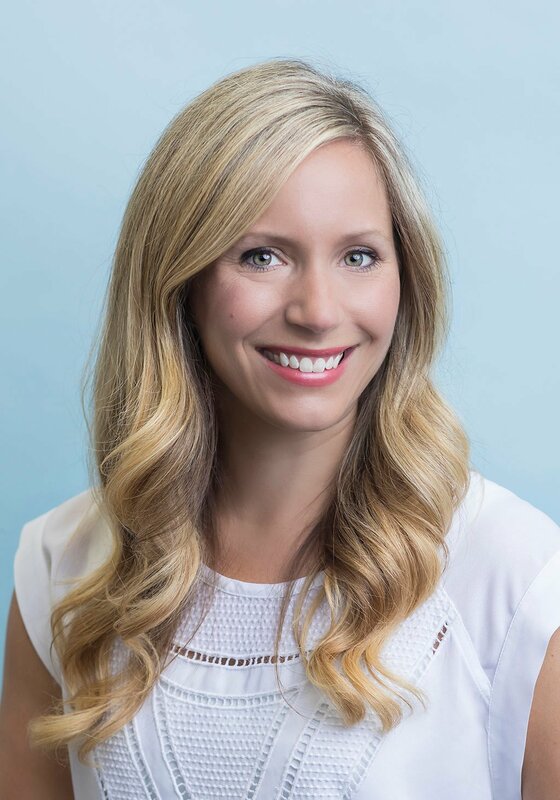 "As with most state-of-the-art surgical suites, data collection includes voice recordings, radiology scans, patient data, and images from endoscopic and overhead cameras and from cameras mounted on booms. The lighting for data collection as well as display (and viewing) is critical, yet complicated. 2. Heat and Shadow Control - Surgeons depend on their equipment to minimize shadows as much as possible. Operating room lights are over the OR table to provide light--without shadow and with the least amount of excessive heat. The problem arises that no matter how low the intensity, a shadow can still be produced. By combining proven reflector technology, the shadow control can be disciplined. Surgical lights provides lighting in the OR and are specifically designed to "illuminate the surgical site for optimal visualization of small, low-contrast objects at varying depths in incisions and body cavities." 5. Deep Cavity Illumination - No matter how deep or narrow a surgical site is, illumination or superior lighting will guide a surgeon. Overhead lighting does not go deep enough in to the cavity. It can drift, create heat and shadows. Headlights bump each other and create shadows. They also can slip and are cumbersome. Amico created the iCE LED surgical lighting system that "allows surgeons to effortlessly direct a precise light pattern into the surgical field while providing the ideal balance of shadow reduction and deep cavity illumination." If you want to perform surgery well, you have to see what you are doing. Surgeon frustration increases with poor visibility. 6. Better Tissue Discrimination - Surgical lights that are both comfortable for the OR team and offer superior color rendition is a win for all. Exceptional surgical lighting systems can offer better tissue discrimination with CRI of 95+. A color rendering index (CRI) is a "quantitative measure of the ability of a light source to reveal the colors of various objects faithfully in comparison with an ideal or natural light source." Simply stated, it is the measurement of light in relation to how it affects the appearance of color. Light sources with a high CRI are desirable in color-critical applications such as neonatal care or operating rooms. 7. Reduce Eyestrain - Susan Cantrell, ELS said it best in: Shedding Light on What Surgeons Need. "The best surgical light provides two things - the correct amount of illumination for the procedure and the right patch size. Brighter does not mean better. Too much [intensity] can fatigue the surgeon’s eyes and cause glare." We concentrate on the quality of light versus the quantity of light. 8. Reduce Reflections, Glare and Poor Contrast - All types of ORs are incorporating various displays and monitors which can benefit from low levels of ambient illumination. Clifford J. Yanke, Ph.D., Director, Healthcare Product Marketing at Kenall wrote: The Science Behind Properly Lighting an Operating Room. He further details, What is the "right amount of light for the OR and Why Green hue-- green-yellow or blue-green?" 9. Create an Operating Advantage for the OR Team - The ambient illumination should provide contrast with the displays and monitors to allow the OR team to view the monitors, perform tasks, and move about the room as needed. Operating rooms are integrating a variety of technological advances which require proper lighting to be fully utilized. Back to the question of how surgical lighting can be improved, when asked how Lumitex lighting technology compared to their current lighting equipment, surgeons agreed Lumitex is more effective. The operating room is a demanding environment that requires precision, efficiency, communication, skilled surgeons and healthcare professionals and quality lighting. Advances will continue as lighting choices and illumination becomes smarter in the ORs and medical field. Each step forward will make for a safe environment for both the patient and surgical team.